Hillsboro Brookwood Library brings new languages to early learners and storytime to multilingual families. 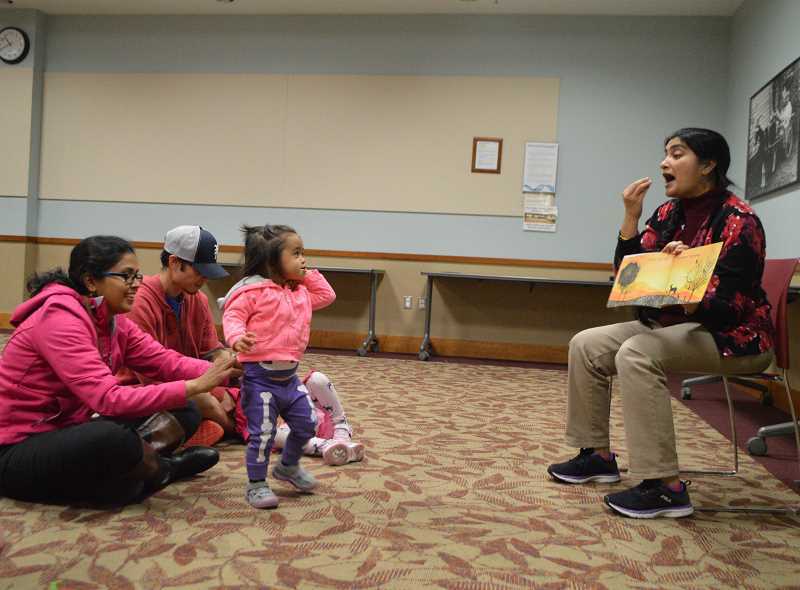 For more than a decade, families in Hillsboro have gathered their young children together on Saturday mornings at the Hillsboro Brookwood Library for an hour of storytime. It's a scene that has played out at libraries across the country for generations. But in Hillsboro, it's not uncommon for the story being read to be in Hindi, Arabic, Mandarin and Spanish, as well as English. International storytime at the library has been a staple at the Brookwood Library since 2007, and has proven popular among families, said Dawn Borgardt, library and youth services supervisor. "That is thanks to volunteers in the community," she said. This year, work is underway to expand the program to other Washington County libraries. Storytime is geared toward children under age 6 in their early learning stages, and not only are stories read, but it involves activities like arts and crafts and music. The program encourages ages as young as a few months old to pick up a language or enhance their native language, organizers said. "It is an awesome time, not just for the kids to socialize, but for the adults to have families get to know one another," Borgardt said. "We've definitely seen families start to meet each other and maybe their kids play together, and then (they) develop a bond." Each Saturday offers something different: the first Saturday is English Language Learner Storytime, offering readings for non-native English speakers to practice their skills; followed by Japanese storytime the second Saturday; Marathi, Hindi and Arabic storytimes on the third Saturday and Mandarin on the fourth. The newest addition to international storytime is English Language Learners, now held on the first Saturday of the month. "It is a twist on having a bilingual storytime, but is geared toward someone learning English regardless of the language, particularly for families coming from somewhere else; their kids are in school and they are learning English but the parents are feeling left out," Borgardt said. "They don't have the same avenues to get brought into the language. Families come away with a familiarity, for example books like "Pete the Cat," a lot of kids know about, and now they have a parent feel comfortable with knowing that story." With plans in the works to expand the international storytime model to other libraries across Washington County, Kate Anderson, a youth librarian for Washington County Cooperative Library Services, is working to bring multilingual story leaders to other libraries through a new pilot program which launched this year. Smaller libraries like Cornelius or North Plains do not have as many resources as the larger libraries, and Anderson said a pilot program to expand multilingual programming will tap into those spaces. 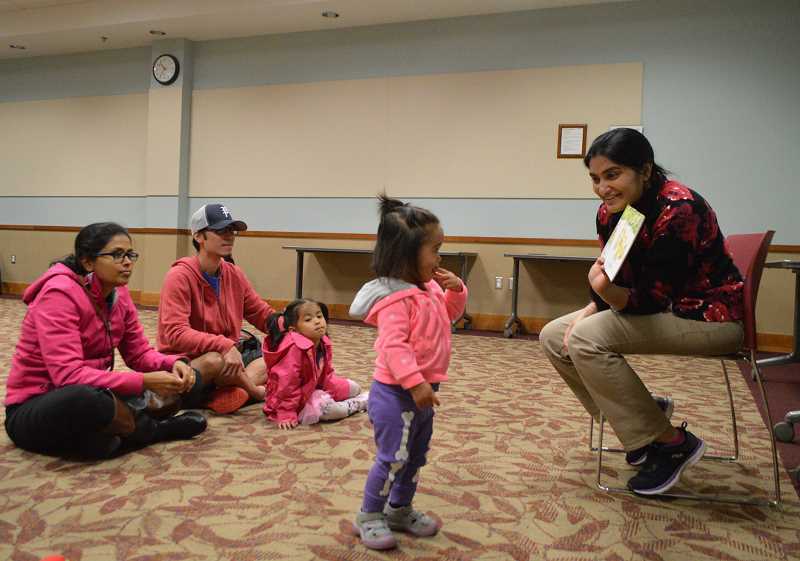 The first county-level storytime under Anderson's supervision kicked off at Aloha Community Library this month, offering storytime in Spanish. Anderson is excited to see it grow and take in feedback, she said. Research shows children who grow up speaking more than one language and focus on retaining their home language do much better in school both academically, socially and emotionally. "This is a pilot project, so we will see how successful it is," she said. "What we worked really hard to do is to contract with storytime presenters who have relationships with the community and understand what people want and need." Anderson and WCCLS have been working with local nonprofit groups such as Centro Cultural de Washington County, the Immigrant & Refugee Community Organization, the Muslim Education Trust and the Mandarin School to recruit story leaders and native speakers of different languages. "(Families) trust them enough to go to the library," Anderson said. "There are some concerns among immigrant and refugee populations regarding going into government-run institutions. To have someone they know and trust there, it is a huge way to make sure that it is successful." Brookwood Library expanded its non-English language children's books earlier this year, purchasing books in a dozen languages, including Navajo, so families could recognize themselves in the books they read. Finding books in different languages can be tricky, especially when you don't speak the language yourself, Anderson said. "There isn't a lot of access to books in other languages if you are looking for books written specifically in that language," she said. "One of the things that is important for families is cultural identity. You want to make sure the books in storytime are from modern-day Vietnam, not strictly old folktales or books written in the '70s that aren't relevant anymore. Kids want to see kids that look like them today, and those are particularly hard to find." Books translated from English are also welcomed for children to become familiar with when they come across them in daycare and school, Anderson said. "It is nice bonding experience when they read the same book as their peers," Anderson said, explaining that knowing rhymes like "Old McDonald Had a Farm" can connect children while learning. 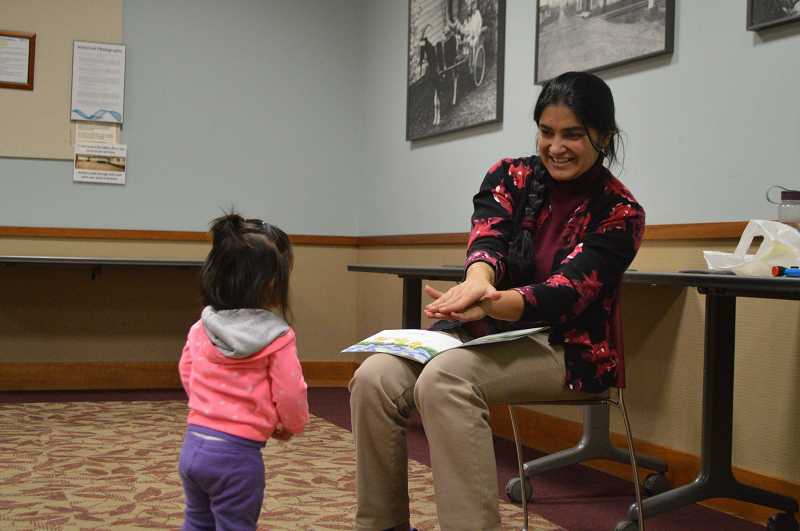 At Brookwood, the third Saturday of each month offers storytime in Hindi and Marathi, languages spoken in India. The group meets in the library's community room and is led by Bakul Godbole, a library assistant. She is one of seven story leaders with the library. "I'm very happy to conduct the storytime here once a month," Godbole said. "I am trying to pass on the language spoken back at home in India, and anyone is welcome to join. I typically do a story in Marathi and one in Hindi, and then repeat the stories in English." Godbole said she loves to share her native language with others, she said. On a recent storytime, she selected a story called "Watch Out," teaching listeners about words for warnings and actions through a tale about animals. Families sit on the floor in front of Godbole, listening to her as she interacts with them. As soon as the story is finished, she jumps into activity time. "We truly do want everyone to feel welcome and participate," Borgardt said. "Not just kiddos who want to listen to a book being read, but we want the kids that run around and sing songs, and we want the kiddos that maybe English is not their first language or Spanish isn't there first language or Japanese isn't their first language, we want to be welcoming to all those groups." Borgardt said the storytimes have helped make the library into a community center where people of all backgrounds can come together. "The literacy piece is crucial, but it's about all the structure around that, too," Borgardt said. "They're in a shared space together and having a shared experience together. There are just not that many spaces where people can participate and do that, and I think that is really powerful. It is great to be a part of families as they evolve … Having the library be the center of all that is exactly where we want to be."